Hand-Rearing Baby Birds - Are you Qualified? Home | Bird Breeding | Hand-Rearing Baby Birds – Are you Qualified? Hand-Rearing Baby Birds – Are you Qualified? Hand-raised birds of all types make wonderful pets, and the process itself seems appealing and attracts many bird owners. However, there are a number of misconceptions concerning the need for hand-raising birds, and also regarding the ease of doing so. Parent-reared birds can bond quite strongly to people and become wonderful companions, especially if taken under one’s care soon after they become independent. In many cases, such birds will be sturdier than hand-reared chicks, and will have been taught important foraging and social skills. 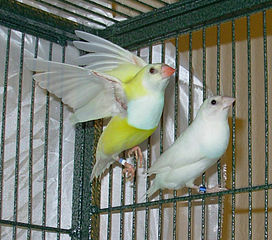 If a bird is to be pulled from the nest for hand-rearing, it is not essential that the new owner be involved. If taken soon after fledging, the chick will bond to people other than those who have raised it. The prospective owners may wish to visit the chick while it is being fed by the breeder (but such is not strictly necessary)…this is definitely preferable to an inexperienced person trying to raise a chick. Healthy parrot and other chicks seem so perpetually hungry that one might be forgiven for assuming that hand-rearing is simply a matter of filling their gaping mouths with a supply of suitable food (please see photo of common cuckoo for an extreme example!). However, nothing could be further from the truth. The undertaking is complex and fraught with difficulties. Even if one possesses the necessary facilities and expertise, the time factor must be considered. Depending upon age and species, chicks will need numerous feedings throughout the day and, sometimes, the night. I well remember waking up at 1AM and trekking to the Bronx Zoo to provide early morning feedings to palm cockatoos and other orphaned birds…interesting, but not for weeks on end! Chicks that are abandoned or purposely taken from the nest for hand-rearing are often stressed. As a result, their immune systems will be weakened, leaving them open to health problems. Food that remains in the crop can decay and cause fatal bacterial or fungal infections; determining that the chick’s crop is empty is not an easy matter. The preparation, cooking, storage and delivery temperature of the food is critical. Details vary greatly with species, age and health. The actual process of feeding the bird often leads to aspiration pneumonia, which arises when the chick inhales food into its lungs; such is difficult to avoid if one is not well-experienced. Feeding utensils can easily damage tender mouths and crops, especially as regards particularly vigorous or lethargic chicks. Utensils that are not adequately sterilized are a common source of bacterial infection. The temperature at which the chick must be kept varies with species, age and health, and is critical. This affects overall health and digestion. If too cool, even by a degree or two, a chick will not be able to move its food through the digestive tract adequately; fatal bacterial and fungal infections are then likely. My work with injured and abandoned chicks has left me with many fond and a few sad memories. Please consider your options carefully, and write in for specific advice. In all cases, you should work with an experienced aviculturist before attempting to raise a chick on your own. For a look at some of the joys and difficulties inherent in raising rare birds, please see my article Hand rearing Palm Cockatoos. Image referenced from Wikipedia and originally posted by Tropical Birdland. My dad has been hand rearing parrots and different birds for years. He has an accurate chart with regimes and feeding times for African Grey parrots but was wondering if there are any charts available for other types of birds? I know he also has problems hand rearing the Australian Kings. He thinks it is due to over feeding the babies… would this cause them not to survive? Does anybody have any advice for successfully breeding these particular parrots? How do you tell for sure that the crop is empty on an umbrella cockatoo who is 4 weeks old? I rescued the baby yesterday. The baby’s crop looks like it deflates, but it’s still a little visible even 9 hours after a feeding (overnight). The crop does go down to that deflated state within 3 and a half to 4 hours during the day. I am feeding Kaytee Exact formula about 11-15cc 4 times a day. Thanks! Hello Sandy, Frank Indiviglio here. Thanks for your interest in our blog. The crop being a bit visible is not necessarily a sign that it is not completely empty (they sometimes stretch, usually if the bird has had a few too many extra large meals)…however it’s a fine line and a trained eye is essential. Be sure the bird is kept at 85F or so, and that the air is fairly humid – otherwise the crop will be slow in emptying and the food may sour. An experienced breeder or avian vet should, however, take a look at the bird, just to be on the safe side – written descriptions of crop emptying/ appearance are not the best option. Hello Kimberly, Frank Indiviglio here. Thanks for your interest in our blog. Many breeders use the guidelines for well-researched species, such as African Grays, for most parrots. This article written by an experienced avian vet does set out some specifics, however. Over-feeding can cause problems, especially sour crop, and can stretch the crop. The crop emptied from the top, so if new food is given too soon, it will lie atop the old food and be utilized first….the old food continues to stay in the crop and eventually sours. A full \crop feels a bit soft, not taut…the crop should be allowed to empty completely at least every 24 hours. I have a pair of CAGs who are sitting on 2 eggs (only one is fertile). They have a past history of eating the legs and wings of the babies if left in the nestbox. I dont know who the offender is (the mom or pop) , but I am considering removing the father bird from the nestbox to see if the mom will feed and care for the baby. I want to know your opinion on this. Do you think the mom is likely to do ok? Or do you think she might abandon the egg if the male is taken away? Hatch is due to take place in approx 5 days so I need to make a decision soon about whether to bring the egg in and feed it from day 1 or take a chance that the mom will take care of it. Let me know asap what you think. Thanks. Thanks for your interest. African Gray parrots are quite complex creatures, and individual reactions to the removal of a mate vary greatly. Unfortunately, there are no hard-and-fast rules. In this and other species, mate loss has resulted in abandonment of the clutch; stress may also depress the immune system, leading to disease. Single parrots of various species have raised chicks, but it does take a toll. If you decide to try, monitor the nest careful to assure the chick is being well-fed. You’ll also need to watch the male, as he may become ill due to immune system depression (seems fairly common among paired parrots that are split. All-in-all, it’s a risky proposition. Sorry I could not offer a more favorable response. Please let me know if you need any further information. Good luck, please keep me posted. I am interested in buying a baby umbrella cockatoo please give me some advise on how to take care of it so it will last me as long as possible Thanx!! Also as a first time bird owner what age do you recommend I buy the bird? Please see this 2 Part article concerning some things that should be considered before purchasing a large cockatoo. They are fascinating birds, but perhaps not ideal for a first time owner. I suggest you speak with people who have kept these birds long-term if possible, to learn just how much time, space and money their care involves, and the potential behavioral problems that can arise. A local bird club should be able to direct you to some helpful members. Pl let me know if you need help in locating a club. A newly weaned youngster is preferred by most people; however there are many advantages to adopting or purchasing an older bird from a private owner – if the bird does not exhibit behavioral problems and bonds with you. 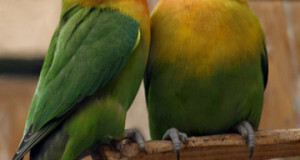 A Ring neck would be easier to manage for a first time parrot owner. However, parrots are extremely demanding, in terms of space and care, and rarely do well when kept alone unless they were hand-raised and someone is at home most of the day to interact with them. Please think this over carefully after reading several books on the subject. 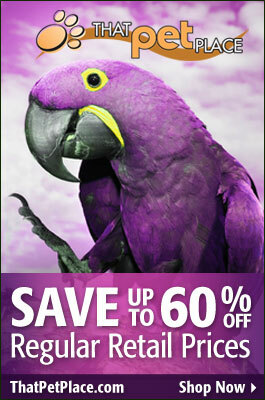 You may wish to speak with parrot owners from a local parrot club (check on line for clubs or societies in your area). Pet stores are generally not a good source of advice.